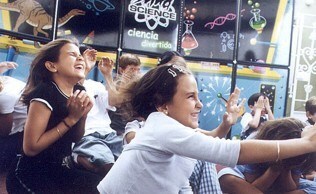 Mad Science has five spectacular, fun and educational shows to choose from! Fire and Ice – Children of all ages will discover how hot and cold science can be as they take a journey through the world of Fire & Ice! Experience chemical reactions that will "magically" make things disappear and reveal the secret properties of special gases! Explore the states of matter and watch in amazement as we demonstrate the extraordinary and chilly properties of dry ice! For our finale, audience members will take part in the mysteries of dry ice as we encounter a dry ice shower, taste a big burp, and create large-scale bubbling potions that fill the room. Jangala Book – Mad Science will guide kids imagination by taking them through the jungle! The Sanskirt work "Jangala" is the origin of the world Jungle, a dense region within a tropical rainforest that receives lots of direct sunlight. We will explore the jungle by the sounds that you will hear, discover the many creatures that habitat in the jungle, and experiment with the chemical elements found in some plants and insects! TA-DA! – Prepare to be amazed as we explore the science behind magic! Children and adults of all ages will leave with an understanding on how magicians use the principals of science to develop illusions. Through our many fascinating acts, we will attempt to make paper disappear, create balls of water, hover over objects, and may even levitate! Toxic Tobacco – Take a tour through the human body to see the way the brain, mouth and lungs are all affected by tobacco. Through displays and demonstrations, students will learn about the important choice to live tobacco free. Students will observe the amount of toxins that build up in a person’s body due to smoking and learn how our sense of taste and smell are drastically affected by tobacco use. We’ll also discuss the powerful impact of second-hand smoke using a smoking chamber. For our finale, students will see the shocking difference between a healthy person’s lung and a smoker’s lung.